From one-bite mac and cheeses to smoky guacamole, here are nine graduation party snacks that can easily be made ahead of time. This upscale take on pigs in a blanket features spicy andouille sausage and sweet mustard chutney. What's the secret to these spicy olives? They're infused with fennel for a fantastic licorice flavor. 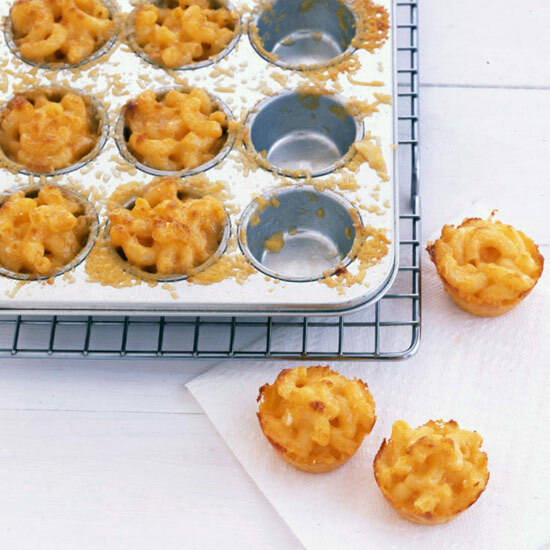 These mini mac and cheese bites can be assembled early and baked just as guests arrive. Serve this Mediterranean-inspired dip with olive oil-marinated cucumbers and toasted pita. Top Chef alum Justin Devillier's version of classic Southern cheese straws are flavored with cardamon but can also be made with ground coriander or fennel seed. These terrific nuts are delicious on their own or served with ice cream. Expert baker Dorie Greenspan's incredible cookies combine sweet dough with savory sesame seeds.